Community telephony initiative Village Telco has developed the Mesh Potato – a device for providing low-cost telephony and Internet in areas where alternative access either doesn’t exist or is too expensive. 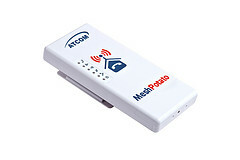 It is a marriage of a low-cost wireless access point (AP) capable of running a mesh networking protocol with an Analog Telephony Adapter (ATA). Wireless APs such as the Meraki or OpenMesh (Accton Mini-router) APs are rapidly gaining in popularity due to their low-cost, relative robustness, and ease of installation. Adding the ability to plug an ordinary telephone into a device like an OpenMesh AP opens up very interesting possibilities.